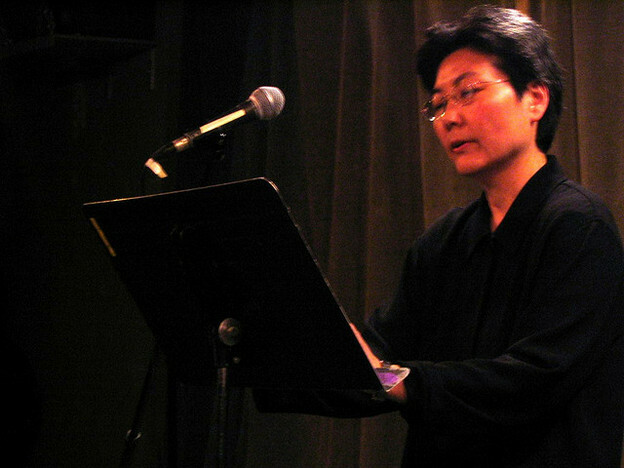 Myung Mi Kim at a Belladonna* reading series event, 2006. Photo by erica kaufman. For readers of Myung Mi Kim’s work, the publication of Penury in its long form (Omnidawn, 2009) is an unlikely chance to view a poem on the move. Unlikely because the thinking might hold that the publication of a full-length collection is the culmination of the work, rather than another instance of its form. However, with Kim’s book this is arguably not the case. When two small presses issued portions of this project in 2006 (From Penury, published by belladonna* books, and River Antes, by Atticus/Finch), readers were met each time not with a draft, but another countenance of the work. So, too, with Penury. 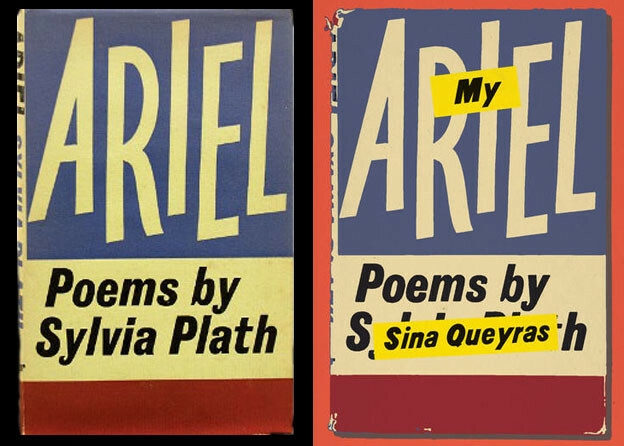 This fact becomes abundantly clear in even a cursory comparison of these books: while an entire section disappears from the poem “fell” in the most recent publication, perhaps more startling is the addition of a diacritical mark resembling an end-repeat in musical notation ( “:|” ) that surfaces incessantly at the left-hand margin, but was nowhere to be found in the belladonna* version. What’s more, the similarities between River Antes and Penury might accurately be described as donation rather than drafting (along the lines of Rachel Blau DuPlessis’s “donor” system in her long poem, Drafts, where text from previous sections of the poem is repurposed in subsequent sections); even though there is clearly some revision from one book to the next, in many ways these are decidedly different books that happen to share some of the same materials. You saw it and you heard it? And yet what remains is not a penury of legibility, regardless of the level of difficulty such writing engages. In addition to critiquing the cost of becoming legible, these poems offer alternative legibilities as a horizon of the work. (As much as “Roots took over the mandible” is an eternal silence, it is also itself a kind of speech.). Thus “fell” is a song of militarized bodies, where displacement is put on display, where even a whimper is legible as song (to cry out, to make a “Hunger noise thirst noise fear noise”). If each line begins in an end repeat (which mark would, in sheet music, signal a repetition of what precedes it), then “fell” extends a cry begun elsewhere, perhaps prior to this book. We might begin to consider whether there can be a canon of cries, whether this work seeks, by motioning to what is prior to itself, such a thing as lineage. We are reminded that even professional mourners have a repertoire, a sense of mastery. At the center of the book is the songbook. However, what it gestures towards is not a tradition, but the participation of a multiplicity of (multilingual) speakers. If we have the script, if we are in fact being (re)educated, then according to the grammar of this book, we’re being put to work. So what then is to be our occupation? What are readers to do with this book that interrogates reading? What does a reader/a reading do here? In the latter half of the book, this attention is figured as preparation for a death and/or a burial (as above) — a funerary concern. Penury takes up the ceremonial as a way of redirecting the pedagogical function of texts, but the particulars of this ceremony (above all its attachment to any specific dogma) seem to have undergone a vast erasure. At one point in the last movement, the score is a wordless series of backslashes and periods, a scansion detached from any verse. The syntactical units of the sentence are sometimes supplanted by what might best be described as sound sets. Often, the passage of these sound sets (they travel) behaves not unlike the more performative reading scripts, issuing an utterance made to nurse the dying into death, like “Abode, braver, avow” (89), and elsewhere, “Abdomen boat // O hewn” (103). Phonemic travel becomes a kind of spiritual accompaniment. This relationship to sound might be what Kim has in mind when she writes of “chants, though their precise meaning was long since become unintelligible / recited from a scroll” (101). What remains of the ceremonial is little more than an intimacy, a collaboration, an acknowledgement of the shared need to mark an affront and a passing, to register a cry “For which no pronunciation exists” (1). What remains is a preparative. If the book extends a sentence begun elsewhere, we needn’t look for that sentence in literary history, though the book might have obvious forebears. And the effort to make the sentence historical (to enter it into record — a few of the poems here are even labeled “transcripts”) would be a corrective to the historical erasures that the book traces: “the place I’m from is no longer on any map” (7). But more than doing documentary, Penury instructs us to seek — in the publication of a book of poems, as in any encounter with language — something that doesn’t easily resolve into what might be recognizable as progress or mastery, an interaction that doesn’t come to a culmination in the document alone. It invites us to participate in attending and extending the limits of a discourse, reexamining the terms by which we measure legibility in that discussion. 1. The former is a pamphlet containing what in the Omnidawn version is the poem “fell,” and the latter is a chapbook that includes a series of trifold spreads.